If you're searching for a very intuitive universal remote that will take your home theater experience to a whole new level, look no further. 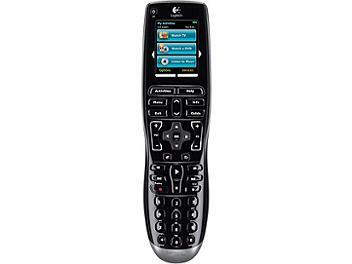 The Harmony/Logitech Harmony One Advanced Universal Remote Control will blow you away, with superb functionality and versatility. Enjoy the ability to control any device and any brand with the built-in extensive infrared database. Now you can finally put away all your remote controls and replace them with one powerful controller. This powerful remote controls your entire entertainment system by creating activities that control groups of devices together. It features a full color touch screen, easy-to-use backlit keys, one touch macro access, convenient Help button, Smart State Technology, guided on-line setup, easy to hold ergonomic design, and a rechargeable lithium-ion battery pack with charging base. With the Harmony One, your entertainment choices are virtually endless. Put away all of your remotes and enjoy easy, one-touch macro access to your home-entertainment system. One simple press of the touch screen and the Harmony One remote controls the rest, including turning on the right components in the right order and setting the correct inputs. Smart State Technology allows this remote to track the power state and input setting of the various components it controls; and offers effortless switching capabilities between watching home theater and listening to music by selecting a single activity button. Gives you easy, one-touch access to any entertainment activity such as watching a DVD, watching TV, listening to music, and more. Connect the remote to your computer and the set-up wizard guides you through the steps. Harmony supports 5,000+ brands and 225,000+ devices, updated daily. This feature provides a step-by-step guide that tailors the device to perfectly match your home entertainment system.